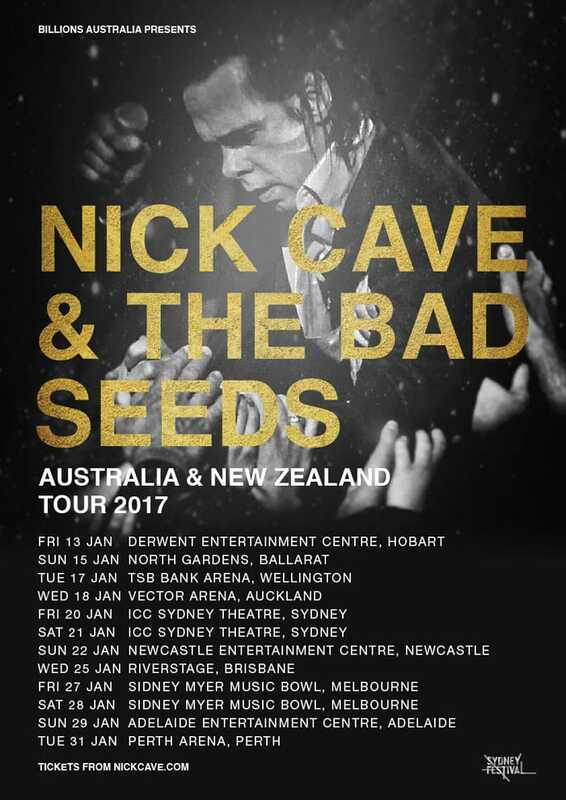 Following their #1 ARIA chart debut for new album Skeleton Tree, Nick Cave & the Bad Seeds have announced that they will be touring their biggest and boldest production ever to Australia and New Zealand in January 2017. The tour starts on Fri 13th January in Hobart, and then the first mainland show is a special outdoor performance on the banks of Lake Wendouree in Ballarat on Sunday 15th January, which will see both Warren Ellis and Nick Cave returning to the area of regional Victoria they grew up in. From there the band plays signature venues in all the major cities across Australia and New Zealand with two dates scheduled for both Sydney and Melbourne. The Nick Cave & the Bad Seeds touring band line up in 2017 features Nick Cave, Warren Ellis, Martyn Casey, Thomas Wydler, Jim Sclavunos, Conway Savage, George Vjestica and Larry Mullins. Audiences in Sydney, Melbourne, Ballarat and Brisbane will also be treated to a support performance from ARIA award winning, cult experimental trio The Necks. The latest Nick Cave & the Bad Seeds album received phenomenal reviews worldwide, topped the charts in eight countries, and gained the band their second #1 album in Australia following 2013’s Push the Sky Away (#1 Feb 2013). Companion film One More Time with Feeling - directed by New Zealand born Andrew Dominik - premiered at The Venice Film festival followed by screenings on 8th September in 950 cinemas across 30 countries in what was intended to be a one-day screening. The incredible response sees the film return to cinemas from Thursday 1st December.